Prepare your barbecue for the indirect cooking method. (including a drip tray) Mix together items 2, 3 and 4 from the shopping list in a dish. Dip or brush the mixture on to both sides of the pork chops. 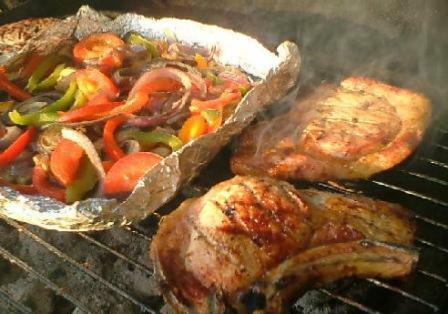 Place chops on the barbecue over the drip try. The chops are cooked through, when the juices run clear. 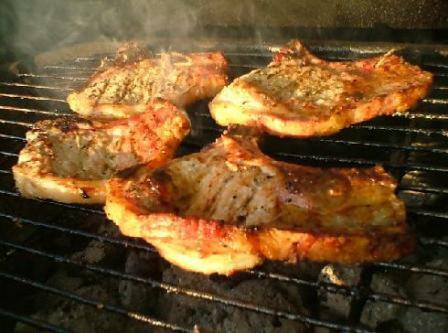 If cooking using the direct method (grilling) the chops will have to be turned to avoid charring. Serve with hot salad, garlic bread and cider or try drizzling the chops with a little honey. When shopping for Pork chops, always ask the butcher for fresh cut chops to the size of your liking. It's recommended to buy thick cut pork chops, because they will not dry out during cooking. Pork chops freshly cut from the butcher is best, the big one's mine.